Jumpsuits won our wardrobes. And it’s not surprising since it is a fashion must have! They work perfectly when you can’t decide what to wear — a nice jumpsuit and some accessories are enough to create a chic outfit in a flash. Now, in addition to women, girls and teenagers also wear jumpsuits. At POCA & POCA we prepared for them offers that will delight every fashion-lover. In order to find a perfect cut and style for children’s jumpsuit, we went for a walk. Paths in the forest led us to a mysterious place, where a blue water surface was shimmering among flowers. There was an untroubled silence around and an ethereal, dignified dragonfly spread its wings sitting on a white lotus flower. We saw the perfect harmony of nature there, which we used to design the delicate, elegant jumpsuits for girls. The calmness we experienced in contact with nature was reflected in the classic cuts of the jumpsuits. We have sewn jumpsuits with long, straight or banana-shaped legs, tapered to the bottom and finished with a chic cuff (in some models there are legs with elastic bands). 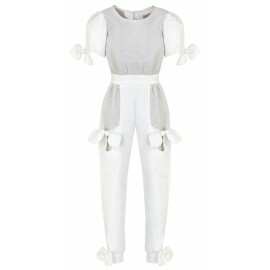 Having summer parties in the garden in mind, we also decided on short-sleeved girls’ jumpsuits. The simplicity of the cut was broken by decorative details. We found the perfect place for them in the waist, at the neckline, on the sleeves and legs, thanks to which the jumpsuits for girls by POCA & POCA gained lightness and charm. Instead of too much decoration, we decided to use fabric decorations - textured materials are intertwined with tulle flounces, glittering trimmings and charming creases, and the sleeves flow down with cascades of several materials, wrapping the arm with butterfly wings or lotus petals. The entire collection is completed by girls’ waist-fitted jumpsuits, where stripes of material, creased flounces and stitchings that highlight the flared material, perfectly underline the silhouette and make it look slimmer. In the design studio we came back with our thoughts to the emerald pond with white, creamy and pink flowers. 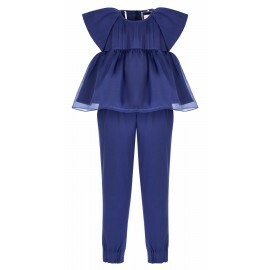 These beautiful colours of nature have created the perfect palette for the children's jumpsuit collection by POCA & POCA. We sewed white, creamy-white, white with grey inserts, blue, navy blue and pink with white, jumpsuits with sweet details, in which each girl will look charming. The toned colours of the fabrics make POCA & POCA jumpsuits suitable for elegant parties. 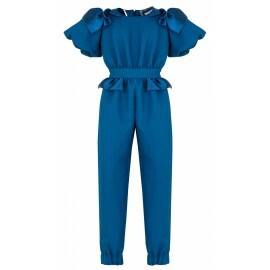 Among several propositions girls will find jumpsuits for special occasions, as well as those in which they can go to school or to meet their girlfriends. 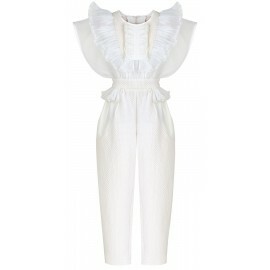 A jumpsuit is just one, but very practical piece of garment. Some people think that girls’ jumpsuits do not fit well and are not good for the silhouette, but this is absolutely not the case if the jumpsuit's length and cut are properly selected. With small elegant women in mind, we have made sure that the POCA & POCA collection includes made with love for fashion stylish jumpsuits that fit girls aged between 2 and 14 (98 to 162 cm) - the larger of which will also fit petite women! 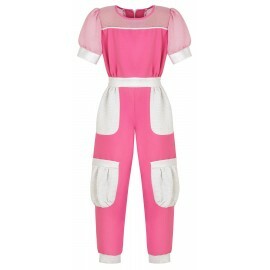 All jumpsuits are made from the highest quality, exclusive fabrics, which wrap the skin with a pleasant touch.